Cadence Court is a fresh take on a popular Block of the Month style quilt. This quilt book features 12 unique wedge designs, each repeating twice, that make up a modern circular design. 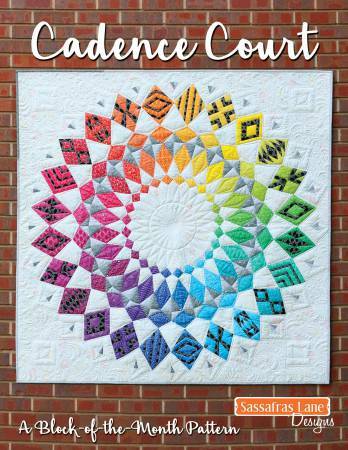 Included in the book are full size foundation patterns and templates, paper-piecing instructions, a coloring sheet, swatch sheet, 8 different quilt color ways to give you endless ideas and more!